What's the Difference Between Land Trust Vs. Family Trust? Land Trust Vs. a Family Trust, what's the Difference? 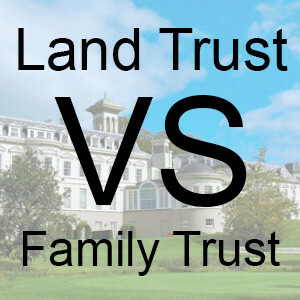 What Is the Difference Between a Family Trust Vs. Land Trust? Family Trust vs. Land Trust: Investing in real estate can be a profitable endeavor if it’s done correctly says, Local Records Office. Today’s real estate investors have tools available to help them protect their portfolios. These tools include land trusts and family trusts. Land trusts provide real estate investors privacy while family trusts provide for effective estate planning. Land trusts are revocable trusts that are used specifically for holding title to real estate. Because each piece of real estate owned by an investor can be titled under a separate land trust, privacy is assured. While you own the real estate in your land trust, it’s the land trust’s name in which the property is titled. Also, real estate in a land trust isn’t subject to liens against the trust’s beneficiary, which is a significant protection. There are several advantages to land trusts. For example, land trusts discourage litigation on the part of people looking for well-to-do real estate investors to sue. In other words, real estate held in a trust can be difficult to tie back to specific investors. Land trusts also can be used to shield real estate investors from any title claims made against trust-titled property after it sells. Consider utilizing land trusts to control the management of the properties in your real estate portfolio and to ensure your privacy. Family trusts can be effective in ensuring minor children and grandchildren are taken care of when you pass away. Family trusts also allow investors to allocate their assets to trust beneficiaries as they see fit. Understand how trusts work before you create a land trust or fund a family trust. Though land trusts can be helpful tools for real estate investors, certain caveats apply. For one, state laws often require that land trusts be overseen by commercial trustees, such as banks or trust companies. This means you may not have total control over real estate you’ve placed in a land trust. Lastly, mortgage liens are public record. Full privacy in a land trust only comes when you pay cash for property you’re titling to the land trust. What Is the Difference Between a Land Trust Vs. a Family Trust?